Vintage - Cris D'Arques/Durand Cut Crystal in the Danube Pattern CRADAN, Set of (7) Seven, Circa 1968. 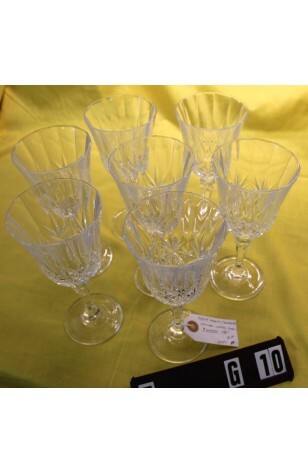 We are offering a Set of Seven (7) Vintage Cut Crystal Water Goblets in the "Danube" Pattern by Cris D'Arques/Durand. These lovely Crystal Water Goblets are Cut in the Star and Fan Motif Design, on Multi-Sided Bowls and Stems. They are French made Stemware in a Pattern which has been discontinued, and no longer available. In Very Good Resale Condition unless noted below or seen in pictures.